I grew up in an era when kids played outside, when you left the house in the morning and didn’t return until you heard your mother calling from the porch for you to come inside. I grew up in a small town not far from where Patrick Lane was born and am familiar with the towns where he spent his young life. It not surprising that his poignant words struck a cord with me the other day when I heard a recording of him speaking at the 2013 convocation at the University of Victoria where he had been granted an Honorary Doctorate of Letters. At 26 he was devastated by the loss of his brother to a brain hemorrhage and a year later moved his family to Vancouver. Trauma followed with the shooting murder of his father 4 years later sending his life in yet another direction; divorce and a move to South America to write full time. As he would later write: ‘I think it was poetry that saved me from killing myself or killing others’. In 1972 he returned to BC and married a for 2nd time but a combination of alcoholism, cocaine abuse and a chance meeting with fellow poet Lorna Crozier at a literary conference ended that marriage 6 years later. Eventually overcoming his addictions Lane would go on marry Crozier, writing several fiction and non-fiction books and a whopping 25 volumes of poetry over the 50 year span of his career. He would become Writer-in-Residence at the University of Manitoba (1978) and teach creative writing and Canadian literature at the University of Saskatchewan (1986-90) and at the University of Victoria (1991-2004). He won the Governor General’s Award for Poetry (1978) and the Governor General’s Award for Literary Excellence (2007), the Canadian Authors Association Award, and The Order of Canada (2014) along with three National Magazine Awards. All this from a kid who grew up in a small town and who never forgot it. You can find out more about Patrick Lane on his website here. Starting after this post I’ll be slowing the barrage of entries on this blog from a weekly one to one that’s monthly instead. It’s not because there’s a shortage of makers out there though. It’s more because I know how much I dislike getting notifications in my own inbox that I likely don’t have time to read and I figure you probably feel the same. Aaaand as they say…absence makes the heart grow fonder. Or is it that good things come to those who wait? Either way expect fewer posts after today. We’re well into the first week of March and it’s snowing outside. Such a pain, but that may explain why I’m drawn to the work of Pippin Drysdale today. It seems to be reaching through my computer screen here; I can almost feel the warmth of those rounded forms on my fingers. Australian-born Drysdale has been making her beautiful ceramic pieces for decades but if it weren’t for several events early on in her life she might not have stumbled across clay at all. Born into a wealthy family in the oh-so-leafy suburb of Toorak in Melbourne she’s said to have developed a rebellious streak in childhood due to an undiagnosed vision problem that was later corrected at age 12. Later, moving with her family to Western Australia and following high school she would go on to being expelled from business college and failing all subjects at technical college. The business world’s loss and humanity’s gain I’d say. A series of short term jobs in Australia and the UK and a year of travel in Europe ended with her returning to Australia in the early 1960s and a 5 year marriage that ended in 1972. So, where do the ceramics come in I hear you ask. I’m getting to that. In the early 1970s Drysdale started ‘Pip’s Flowers’ in Melbourne selling her own handmade paper flowers. I suppose it didn’t last because she soon returned to Western Australia, starting a business selling fresh herbs that would eventually be sold across Western Australia (take that business college) and where she commissioned a potter to produce clay vessels to hold the herbs. And that ladies and gentlemen is where she was introduced to the intriguing world of clay. The potter became a friend and built a kiln for her in her back yard where she started making her very own small pots and goblets (I wonder if she still has any of those first pieces). Talk about a circuitous path to finding one’s raison d’etre, and proving that you don’t necessarily need to succeed in grade school or business college to succeed in life. Driven by her growing passion she obtained an Advanced Diploma in Ceramics from Perth Technical College in Western Australia in 1981 and later completed a study/work tour of Italy and the US in 1982. Three years later she obtained her Bachelor of Arts (Fine Art) from Curtin University in Western Australia and in 1997 was selected to be a Research Fellow at the School of Art, Curtin University of Technology. I’m thinking her grade school teachers would’ve been surprised that she would go on to be awarded with both a Master of Australian Craft in 2007 and a Lifetime Achievement Award in 2011 from Artsource. ‘She draws inspiration from the colours and textures of landscape, and her emotional interpretations of place and space are injected into each of her pieces. Pippin focuses in particular on the vast, diverse Australian landscape and has created series based around the patterns and colours of the Pilbara region, the eastern Goldfields, the Kimberley, and the Tanami Desert. She has also travelled overseas to draw inspiration from the dips and peaks of Pakistan, India, Russia and Italy’ (via: The Government of Western Australia). Check out her website where she’s happy to share her wealth of experience about techniques and look for her on Instagram here. Lovely. Porcelain: the word makes me think of thinness and paleness, translucence and fragility, the antithesis of all the ugly chunky coffee mugs and scratched ikea dinnerware I have in my cupboards. (how do I survive such a wretched existence?) I’d trade them all for just one sculpture by Takeuchi Kouzo though. In his skilled hands porcelain is something rare and beautiful, a play of light and shadow on velvety smoothness, a state of sculptural decay captured forever. In my small world there’s nothing quite as beautiful as organic texture; like the chunky rough planes of a mountain rock face cut in light and shadow, or the layered hide of a tree trunk, gnarled by decades. I find it difficult capturing those surfaces on a piece of metal though. Yes, I’ve carved a replica of a natural texture in wax and although I’ve not tried it I could make a rubber mold of an organic object and cast it. Or there’s sand and surface casting that make some great textures too. But is there a way to transform a smooth piece of sterling silver wire or sheet into chaotic gorgeousness without all that fuss and equipment? If you own a propane or acetylene torch and a ceramic brick then the answer is yes…because sterling silver + heat = texture. It’s good to know (especially if you’re new to jewellery making) that sterling silver is made up of 92.5% silver and 7.5% copper (added to increase hardness). As you heat it with a gentle to medium flame it begins to glow dark red. At that moment the piece is annealed…previously disorganized molecules become more organized. With continued heating molecules of copper in the piece which have a higher melting point than the silver begin to migrate to the surface. You’ll know this because the surface will turn from silver to black. If you quench the piece (in water) and pickle it (in an acid solution which removes the fire-scale) and repeat that heat/quench/pickle cycle 10-15 times, a layer of pure silver will gradually accumulate at the surface while the copper beneath (remember it has a higher melting point) will begin to ripple with the silver flowing over it. And that’s where the weird wavy patterns on the surface become apparent. The process is called reticulation and you can read more about it here. I love the randomness of it and am playing with my heat level and the surface I’m melting on – ceramic brick, charcoal etc. So many variables and so much fun. Is it just me or are we a nation looking outward when it comes to artistic talent? Or is it that I’m just waaaay out of the loop when it comes to Canadian Art? Probably. I don’t remember when or where I first came across the astounding work of realist painter Mary Pratt but I do remember feeling drawn to it; domestic scenes painted in luscious colours. And that light that made you believe you just had to reach through the canvas to feel the sun’s warmth in a scene or run your fingers along the plastic wrap, paper and tinfoil she rendered so well. Born in Fredericton, New Brunswick in 1935, young Mary (West) grew up in a prosperous household. Her dad, a lawyer (who would go on to became Attorney-General of the province) and her mom (who seems to have had no career other than housewife…not that there’s anything wrong with that) encouraged her early artistic nature. At 18 she attended Mount Allison University just 2 hours down the road to study Fine Art. There she met and would later marry her first husband, painter Christopher Pratt. They would have 4 children together and despite the challenges of raising them Mary was somehow able to find the time to paint during those years. Now, I don’t know about you but I’d find it tough getting the time and energy to paint with even one child around. And if that wasn’t enough, then her ability to beautifully capture the most minute details of her everyday subject matter was astounding. It seems that subject matter had the Canadian art scene confounded though. Was that salmon a metaphor for simple domesticity or was it whispering something much more unsettling, something feminist? Oh my! Was she just a wife and mom painting pretty pictures, “the visual poet of the kitchen” as a Globe and Mail critic called her? Or was she making a statement about the wretched place of women in society? She definitely existed in another era…where people grew fruits and vegetables and preserved them and where their caught food was cleaned and prepared. Was it so terrible that those simple subjects captivated her? It’s said that she jumped up one day at the dinner table ready to paint the scene in front of her and that when her husband told her the light in the room was changing too fast he quickly got his camera and took a photograph of the table. Later with the developed slide Pratt was able to capture the scene as she’d intended, amazing light falling across a seemingly mundane subject. Her decision to use photographic slides to paint from after that was of course frowned upon by others and this criticism hurt her so much that she stopped painting for a time in 1970. Tisk tisk. Such a shame. Let’s be honest here…who likes laminate; the low budget, plastic and ugly imposter of natural materials like stone or wood that’s used for furniture and countertops? How about laminate as a material for jewellery? And how about jewellery that doesn’t rely solely on the intensive mining of gemstones and precious metals? 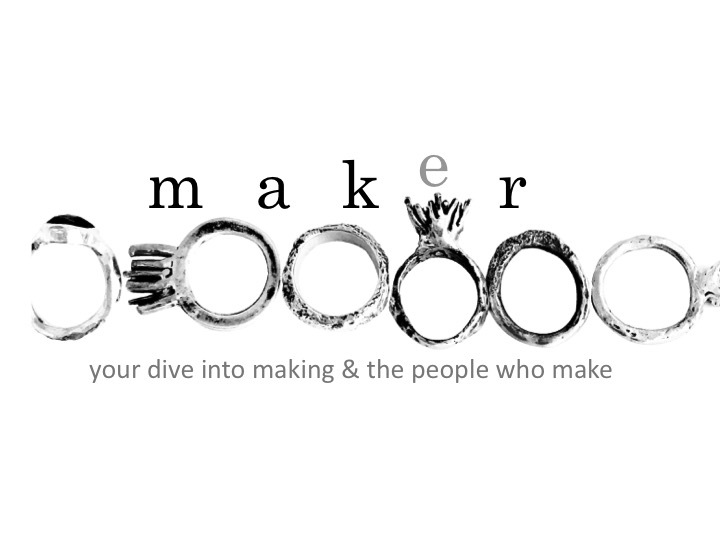 Welcome to the world of maker Karen Vanmol. Inspired by architecture and nature Vanmol designs using traditional techniques like hinging, threading and sawing to create her graphically bold pieces. And she’s fascinated with paradolia – the psychological phenomenon that describes how we humans try to make sense of random stimuli or patterns – if you’ve ever gazed at a cloud in the sky and decided it looks like a horse or a flower or whatever, or seen a face when you look at the moon, then you’ve experienced paradolia. ‘Protecting or imitating nature, the use of natural materials in architecture, the restoring of a road surface, accidental strong shapes on a construction site, these things I find very interesting. On my way through town, I hunt and collect. I always encounter interesting images that I use as an inspiration. In addition, there is a certain choice of materials and colours, these are strongly influenced by memories. For example the necklaces, furniture in different colours, certain constructions. I have my story and the viewer projects its own story on top of mine. I’m loving the intensity of her pieces, the colours, the shapes, the clean lines AND the fact that she’s able to use a material like laminate (so it stays off countertops). You can find out more about Karen on her website or Instagram.